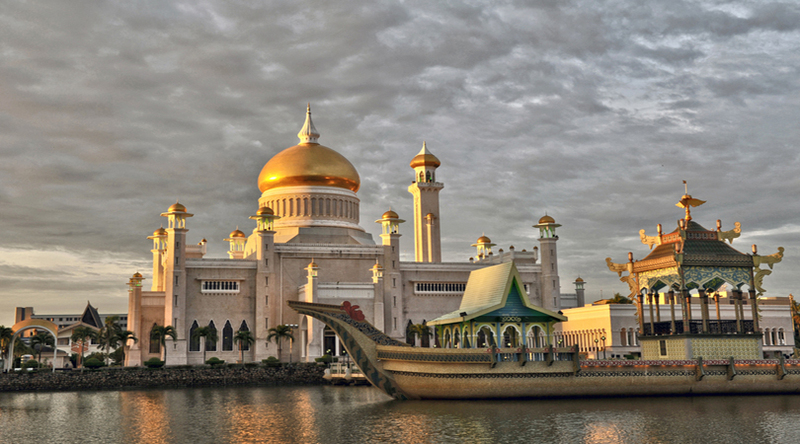 Situated on the banks of the Brunei River in Bandar Seri Begawan, the capital of the Sultanate of Brunei, the Sultan Omar Ali Saifuddien Mosque is among the most iconic landmarks in this bustling city. Although the population of the sultanate is only around 400,000, more than two-thirds of the residents are devout Muslims. For them, the mosque is more than something beautiful to gaze upon; it is a place to show their reverence for Allah. Should you visit Bandar Seri Begawan, you’ll see the mosque wherever you go. Consider taking a closer look to fully appreciate its incredible design. Named after Omar Ali Saifuddien, the 28th Sultan of Brunei and late father of the current sultan, Sultan Omar Ali Saifuddien Mosque was completed in 1958. It is situated on an artificial lagoon that serves as a reflecting pool, enhancing its already scenic and memorable appearance. Plans for the mosque, which dominates the skyline, were initiated by His Majesty. Cavalieri R. Nolli, an Italian architect, worked in conjunction with A.O. Coltman of the Booty and Edwards Chartered Architects firm of Kuala Lumpur to finalize the plans. The actual construction was performed by Sino-Malaysian engineers. All told, the project cost between 7.7 million and 9.2 million dollars. Its design features a combination of modern Islamic, Italian and Renaissance architectural elements. It includes a courtyard, marble minarets and a dramatic dome with a pure gold leaf covering overlaid by a mosaic of 3.5 million glass pieces. At 52 metres in height, its minaret is the tallest point on the skyline. When the new Islamic Bank of Brunei building exceeded its height, the sultan ordered the removal of its top storey. Interior features include semi domes, stained glass windows, marble columns and arches. The mosque includes granite from Shanghai, marble from Italy, carpets from Saudi Arabia and crystal chandeliers from England. Should you decide to visit the mosque, please note that the interior is strictly intended for prayer; non-Muslims may not enter. If you are Muslim, however, be sure to take the elevator to the top of the minaret for incredible panoramic views of the area, including the village of Kampong Ayer, which is also known as the “village in the water”. The grounds around the mosque are equally stunning and include gorgeous trees and impeccably landscaped floral gardens. The lagoon includes marble bridges, with one leading to the village and another leading to the replica of a 16th century barge that was used for Quran reading competitions. 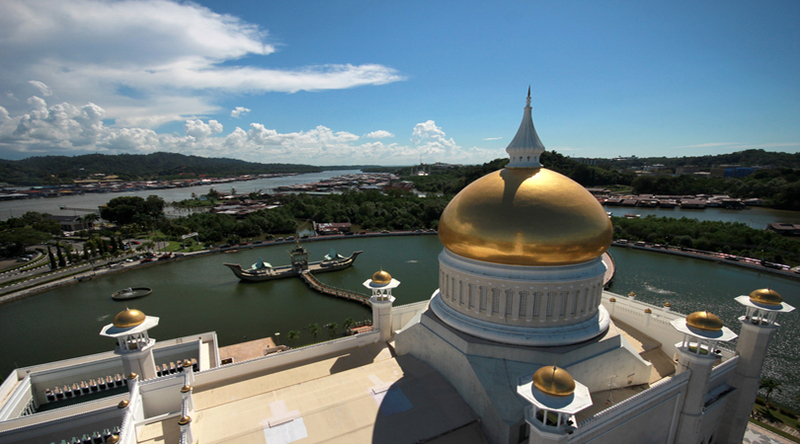 The Radisson Hotel Brunei Darussalam is conveniently located just steps away from this stunning mosque. On foot, it only takes about 10 minutes to get there from the hotel. No visit to Bandar Seri Begawan is complete without at least one visit to the mosque, so be sure to include it in your itinerary.